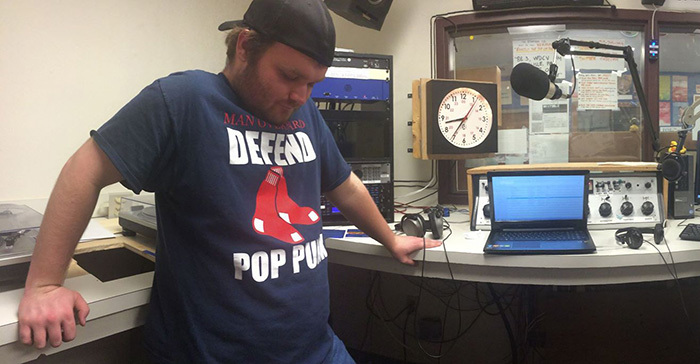 WDCV station manager and DJ Jon Northridge '16 listens to music during his radio show. As a music minor, WDCV DJ and Composed volunteer, Jonathan Northridge ’16 understands how to make and play music, and as a WDCV station manager, radio intern and economics major, he understands the business of music promotion too. Jon shares his passion for music, movies and friendship, and his star-studded post-Dickinson plans. WDCV (station manager), Composed, College Choir, Gaming Club and Skate Club. I chose Dickinson because it allowed me the opportunity to take a wide range of classes while still getting a goal-oriented education. Even the classes I’ve taken outside of my fields of study (most notably, with [former Visiting Assistant Professor of Theatre & Dance] Jon Liebetrau and [Professor of Theatre] Todd Wronski) taught me a lot about myself and the world around me. Music in Film with Professor [of Music Blake] Wilson has been my favorite class so far; it helped me discover the symbiotic relationship between two of my favorite art forms. I interned at 101.3 The Rose (now known as Fun 101.3) and 92.7 KZF (now known as WLPA). The internship appealed to me because I had grown up listening to these stations, and it was cool to see the back end of the studios. I also learned a lot about how a commercial radio station works and whether the radio business is right for me (spoiler alert: it is). Jon Northridge '16 gives a LeTort student a lesson on guitar, one of four instruments at the focus of the afterschool songwriting program Composed. Photo by Tony Moore. I want to go into the radio business, have a family and meet Dave Grohl. The most valuable thing you can ever give someone is your time. Make sure you spend it well, whether you are building houses for the needy or talking to your friends after a long day. I can play Guitar Hero better than anyone I have ever met, except Louis Manza. Forming a band (formerly known as What Women Want to Hear, then 5 Men and a Baby, and now 2 Men and a Baby). … I would own a house in between Dave Grohl, Emma Watson, Stephen Risko and Dalton Maltz ’16.